Swanson: Yeah, I figured it was time for another Vincent Price film, and this is one of my favorites. Enjoy the show...there are a few surprises in this episode! What an amazing episode, God you guys are so entertaining it is such an enjoyable listen and I can't get enough. shock i must know what you said during the beeping on the satanic rites????? this is my favortie episode so far i was ROFL!!!!! great mate!!!!! Mr. Shock; I loved the Price clip you added from the movie, that alone got me excited to go back and see HonHHill. What a soothing voice and brilliant actor. Mr. Shete is sure a great ad-libber and funny as hell. Mr. Hunter is really coming into his own, he was really funny on this podcast. Mr. Hunter has come a long way since the start. Amazing from Mr. Henrikson that was cool. I could keep going on&on; well done. Thanks so much, everyone, for the comments. D.A.B. : Thanks for the kind words. they are appreciated (and yes, that sponge was ENORMOUS. LOL). Anonymous: I'll leave the (BEEP) to your imagination (but it really DID need to be edited...this was a horrid movie). Thanks so much for the compliments. I appreciate them more than you could know. Anonymous (2): Thank you so much for the kind words. I couldn't agree more about Vincent Price's voice (which is why I just HAD to get a clip of it out there). I also couldn't agree with you more regarding my co-hosts. We've all started to gel really well together, and have a great time recording the show. Glad to see you enjoy listening as much as we enjoy making it! Thanks again, everybody...your comments are appreciated! And thanks for listening to Planet Macabre. Previto: Thanks for stopping by. Thanks for the congrats on Planet Macabre reaching #1. It's a great thrill. And yes, I'll be dedicating the next 2 weeks here to horror films. Super show no.8 and now I have to wait 2 more wks for another. :( Bring us more dr. 5 easter movies next holy cow cant believe there is that many in horror. Rich: Thanks for stopping by. Glad you enjoyed ep. 8 (and sorry about the wait between eps). As for the 5 Easter movies, I can honestly say I've seen NONE of the 5 we're covering, so it should prove an interesting show. Thanks so much for the comment, and for listening to Planet Macabre. f. Buckner: Thanks for stopping by. I haven't yet seen the remake of HOUSE ON HANUTED HILL, but I'd be interested to see how it measures up against the original. When you've seen both, please stop back and let me know what you thought. Thanks for stopping by, and please let me know what you think of the movies after you see them! Thanks also for listening to Planet Macabre. You know Dr.Shock this would be my favorite horror film ever if it wasn't for Hitchcock. I would of liked to hear more about the movie on the podcast, but I am sure your limited on time and it is truly nice of you to post more details here. I actually have this on DVD in sealed plastic I saved when it was released on DVD in 1999, then in 2008 they came out with a dual-disc a color and B-W version, that's wrapped too. Such a scary movie for the time. For your fans, you can rent this on demand for $2.99 but please listen to Dr.Shock and buy this one you will not be disappointed. Fun episode on the Planet Pod Doctor. I will be seeking out House on Haunted Hill. During the Easter episode is one of the reviews going to be Donnie Darko? That is the only horror movie I even know of that has a Bunny even though it is really not Easter related. OUTSTANDING reviews of the Hammer Horror Films. The most detailed talk covering movies of this type I have heard. A huge POSITIVE! Bryan: I'm glad you also enjoyed HOUSE ON HAUNTED HILL, and thanks for the info about it's on-demand availability. And I agree completely: this movie is surprisingly spooky for its time (Thanks also for backing up my 'buy' recommendation. I appreciate it). Meg: As far as I know, the movies chosen actually have an Easter theme, which I think excludes DONNIE DARKO (a movie I really, really like, BTW). Thanks for listening, and please let me know what you think of HOUSE ON HAUNTED HILL when you get a chance to check it out. Anonymous: Thanks so much for the kind words. I only wish we were covering a different period in Hammer's history...I know I would have had more recommendations if we had! just grabbed the track on itunes already lookes like a huge success with all the comments. glanced over the ratings and looks like you were out on a limb on a few. cant wait to hear the discussions. Thanks for stopping by, and I hope you enjoy the show! Please stop back, and let me know what you think once it's finished. i knew the macab pod was special when i found it on google & now knowing there are 75 thousand fans is impressive. congratalation on that top dog position and i can only imagine the fans ever more increasing once they listen. my friend has this movie and i am going to borrow it since you rated it so high. Thanks so much for the kind words, and we're happy you found us! It's excellent having so many loyal listeners. 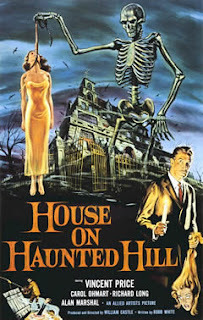 Please let me know what you thought of HOUSE ON HAUNTED HILL when you get a chance to watch it. Thaddeus: Thanks for stopping by, and for the comment. I'm glad you enjoyed House on Haunted Hill. It is an entertaining film. Hopefully, I'll be able to give you more picks to match the quality of this one. There was only 1 horror movie that avg'ed 6 or above rating and that was Vampire Circus, at 6.1, barely, I am getting the Blu-Ray on that and I am also picking up the Uninvited and the Horde on Blu-Ray, a few of the hosts pick. Yeah, it really wasn't a good selection of films if you're looking to buy them (though I definitely recommend the VAMPIRE CIRCUS Blu-Ray), I'll be picking up THE HORDE myself (seeing as I already have THE UNINVITED). Glad to hear you enjoyed the movie (and I've had some fun creeping out my wife with horror movies over the years as well!). Seen it. Loved it. Udaman. Udaman: Thanks for stopping by. I'm glad you enjoyed the movie. Hopefully, I'll have another one you'll like just as much on the next show (which posts one week from today). Super episode Dr., I admire Hammer Productions like you so I was a little surprised of some low ratings on a few by you. I don't think any Hammer Horror deserves a "1" but that is just me. Your DVD this week is a good one. I even watched it twice over the last week really studying it. A great horror movie indeed. Sweet T's I really like the "Signature" black design. Well done. Keep on rolling with the oldies Dr., I will be listening. @Sebastian: Thanks so much for stopping by. I'm glad you enjoyed HOUSE ON HAUNTED HILL, and thanks so much for the kind words. They are appreciated. @wei xuan: Thanks so much for the kind words. They are appreciated. I'm glad you enjoyed the Podcast, and I'm also happy you liked HOUSE ON HAUNTED HILL.